New view home in Ruston overlooks Point Ruston. A new home being framed for the Curry’s in Ruston. Our client has a done a great job interpreting our design. As you can see it's in the mountains (and fog). Wonderful detail in the stone columns with concrete cap stones. The tower has taken shape. Winter is rolling in likely slowing some progress, but we are getting excited! Timber posts, beams and trusses, awesome! Finally moved in to our new office. But, of course, still need to put some things on the wall. Thanks to all of our wonderful clients, we are having trouble finding the time. We had six years in our old office - When you visit or have your next meeting, remember to travel up the street to 2602 N Proctor St, Suite 206. Just above Starbucks! Its been a few years of preparation, but Doug Loeb of Seattle is ready to begin his wonderful timber frame home high on a hill in White Salmon. The hidden property has wonderful views south to the Columbia River, and bookend views of Mt. Hood in Oregon and Mt. St. Helens in Washington. We can't wait to see his craftsmanship. The Dogeagle's home is rising from the ground on Starr Street in Tacoma's Old Town. We are so very excited that all of the thought and care that went into understanding the owner's lifestyle and the neighborhood they selected, has really yielded fantastic results. This "right sized" home will take advantage of the view down Starr Street to Commencement Bay and will fit wonderfully within a neighborhood of bungalows, infills and cottages while being uniquely of today. Renton "right sized" home finally comes to life! We have recently completed this Gig Harbor Asian Contemporary Home. Beautiful views and elegant casual design. So, I tend to have a yearning for cartography. It may stem from my background as an architect, an artistic, technical and graphically based profession. But, I also have always had a need to understand the world we live in, explore new things, see the things that we in America are so far removed from. It does seem that we have blinders on sometimes. Honestly, the United States has so much and dominates so much culture it isn’t very hard to think that this is all there is. Exploring both historical and modern maps can bring the rest of the world into focus. Exploring map based infographics can be very enlightening as you try to understand relationships between all parts of the globe. I had the pleasure of taking a cruise around the Mediterranean a few years ago. My wife and I had such a great time exploring the historical places and artifacts and the life of strange cities. I thought, wouldn’t it be great if the Mediterranean wasn’t so far away? Well, I was examining maps and globes and realized that the Mediterranean Sea is at the same Latitude as the United States. If only it were possible to rotate the Mediterranean Sea around to our side of the planet? Would it fit? What effect would this have? What about the states… new coastlines in the middle of the country… new relationships… states torn in pieces? A couple of screen captures, lots of graphic manipulation and now we know. The Mediterranean Sea fits within the confines of the United States of America. In a way, it is pretty amazing how big the Mediterranean Sea is. We always think if the United States as a vast country, more than 3000 miles from east coast to west coast. It used to be quite a task to traverse that distance. Amazingly, ancient mariners of the Mediterranean traversed similar vast areas of water for their commerce, and conquests. So, what have we done? This is a new vision of the United States of America. A few states have been unaffected by this mash-up. Washington, Oregon, Arizona, Minnesota, Wisconsin, Louisiana, Ohio, Pennsylvania, Maryland, Delaware, New Jersey, Connecticut, Rhode Island, Massachusetts, New Hampshire, Vermont, Main and Florida. Yes, I am ignoring Alaska and Hawaii since they are remote, sorry. It’s interesting to note that by adding the Black Sea, it nicely takes the place of our own Great Lakes. The Canadian provinces of Ontario and Quebec get new coastlines, but Lower Ontario becomes an isolated piece on the US side. A Canadian interloper if you will. Although the Great Lakes are very large, I believe the area of the Black Sea is larger than the combined Great Lakes. In this alternate US the remaining areas of the Great Lakes become great grassy plains… perhaps, International Park Reserves, or snatched up by neighboring states. Michigan loses a large portion of its “mitten” and the upper peninsula becomes the state it always wanted to be, Superior.
. Kentucky hugs the southern coastline of the new “rust belt”. The Greek Islands of Karpathos and Rhodes would be part of Kentucky. What a history to explore. , the eastern arm of the Mediterranean. The southern states have been effectively cut in half. Oddly, mirroring the Turkish grab of part of the Island of Cyprus, West Virginia has grabbed a part of this alternate Cyprus that is mostly in Virginia. The State of Tennessee has been reduced to a portion of the former Island of Crete. reaches into North Dakota and cuts South Dakota into the new states of East Dakota and West Dakota. West Dakota is the new Tuscany and East Dakota approximates Croatia. Nebraska is now the main “boot” of Italy with coast on the east and west. Kansas takes over the “toe” of Italy and Sicily (except Colorado has made a foothold on the western tip). and reaches all the way up to Montana and the Custer’s Battlefield Monument. Wyoming has split into the new state of Yellowstone (with the amazing Yellowstone Park) and the Wyoming Islands (Corsica and the Northern part of Sardinia). Idaho gains new coastline. Texas, New Mexico and Colorado have a great new coastline. Although Colorado has been mostly swallowed up and maintains the southern part of Sardinia and an outpost on Sicily. Utah has split into the coastal area along the northern edge of Arizona and the Great Salt Islands. Nevada has lost the southern portion to a new state called Las Vegas. In return they get a Mediterranean coastline. I think that would be a good trade. The new “Sea of California”, the western outlet, splits the state into Northern California and Southern California… most Californians want that anyway. This leads us to the “Strait of Pismo” and out to the Pacific Ocean. There just may be a “Rock of Pismo” in place of the “Rock of Gibraltar”. Not quite the cache’… I would say. Chosen Best of Houzz 2014! Thanks for choosing us as a Best of Houzz Award recipient! Chosen Best of Houzz 2013! Take a look and leave us a review if you can. Drager Architecture featured on Houzz now! Thanks to all of you we were successful! We have been voted the South Sound Magazine Best Architect again. This is some important marketing and I sincerely thank all who helped make it so. We have some exciting projects underway. I hope to have some information posted to show you what we are up to! Although the South Sound Magazine posted the voting went until March 22nd, Apparently that meant voting ends on the 21st. Thanks to all who got a chance to vote. I really appreciate your support! It's time again for the South Sound Magazine Best of! Because of your votes, 2010 was a great year being named Best Architect. We feel that we should be considered again and we need your help! We would appreciate your votes again. In 2011 we fell a bit short of votes, but got mentioned (The large 100 person firm got it again). to go to the best of South Sound page. • You must vote in at least 10 different categories for your entry to be valid. • Voting ends March 22, 2012. Winners will be announced in the June/July issue of South Sound Magazine. Best Remodeler: (Pick one) Gary Howe Construction, York Enterprises. Best Builder: (Pick one) Gary Howe Construction, Daniel Martin Construction, Al Fujita Construction. Thanks so much for your support - this is an important marketing effort for us! The Master Builders Assoc Tour of Remodeled Homes is this weekend. We have a project in the tour that was built by York Enterprises. Duke and his crew did a great job! Please come out and say hello and view our design work. We are very proud of the results! The location is 1116 N 26th Street in Old Town. Come see how it looks now! Time to vote in the 2011 South Sound Magazine "Best of"
Just click this link and meander down the page to HOME & GARDEN - Best Architect. I found this new product at, ecohomemagazine.com, called rSTUD. It may be an interesting energy saving development. These are engineered wood studs that have an inner core of high density foam. Our Blank-Menzel project uses a product called Structural Insulated Panels (or SIPs) for the exterior walls and roofs. 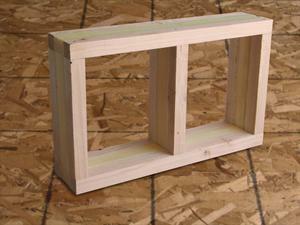 Essentially, the conventional exterior framing of the structure is replaced by these panels. The value that these panels gave us was a super insulation, less labor and less waste. At this time it can be a bit more expensive than conventional framing and few builders are familiar with the process of construction with them. I found this company called Winter Panel that manufactures three SIPs panels that you may want to consider for your next project. The company offers SIPs in three panel types: StructureWall, CurtainWall, and PineClad. StructureWall panels, which replace studs and rafters, are twice as strong as a 2x4 wall, according to the firm. CurtainWall panels, ideal for timber-frame or metal-frame buildings, include an interior skin of gypsum for finishing. PineClad panels offer the benefits of StructureWall but with an interior finish of tongue-and-groove pine. Foam cores are available in expanded polystyrene or polyisocyanurate. 802.254.3435. http://www.winterpanel.com/.